Thai Massage is often erroneously regarded as a strong and even painful system. However this has nothing to do with the massage, and everything to do with the therapist. The fact is that Thai Massage can be done strongly or very gently, depending on how the therapist is working. There are many techniques in Thai Massage which are not much used in other modalities. Two examples are stretches and traction moves. Do you know what exactly the difference is between stretches and traction? This video demonstrates it clearly. Here is the main difference: Stretches in Thai Massage work on muscles and traction works on joints. Working therapeutically doesn’t mean that you need to know lots of special and unique Thai Massage techniques. But it does mean that you have to approach therapy sessions in a different way from doing regular whole body sessions. When you want to do effective therapy work, you will often have to forego whole body sessions due to time constraints and focus on specific areas which need the attention most. There are several elements which will improve your therapy work. Thai Massage is a close contact massage system. The client’s body is moved all over the place by the therapist. You can’t do this from a distance. The therapist has to get in close and use his or her body and body weight to accomplish those techniques. Learning Thai Massage techniques is actually just partially technical. The second part is intuitive, sensitive and responsive. The secret to making Thai Massage feel wonderful is to master this second part. The problem is that this second and so essential part of Thai Massage techniques is often not taught at all. That’s the reason why this great healing art has the reputation of being painful and strong. Thai Massage is often shown as a series of fancy and complex stretches which seem to be best suited for experienced yogis. However what really counts in your everyday Thai Massage work as a therapist is not the degree of difficulty of the techniques, or the number of fancy stretches you know. What really counts is your quality of touch and your ability to intuitively connect with your client. Thai Massage is a graceful and artistic healing arts modality. It takes a lot more than knowing how to do a particular massage stroke or technique. You need to know how to use your body correctly, how to have good ergonomics and how to work with least effort. This includes knowing how to move your clients gracefully from one position into another position. This video demonstrates how you can move your Thai Massage clients between supine, prone, side and sitting positions without having to ask them to turn around on their own. The author, Shama Kern, is the founder and director of Thai Healing Massage Academy. 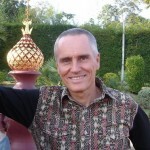 He has been practicing and teaching Thai Massage for 18 years and he is the creator of several other healing arts systems. What Is The Best Mat For Thai Massage? Most western massage styles are done on a massage table. Thai Massage however is traditionally done on a floor mat. Although it can be done on a table as well, working on the floor provides better leverage, more power, and better ergonomics for the therapist. Most western therapists have little or no experience of working on the floor. One question which I often get from new Thai Massage students is what mat they should be using. The right mat is quite important since it can make the difference between feeling comfortable during your sessions and not feeling at ease, or even inconvenienced. Continue reading…What Is The Best Mat For Thai Massage?